And so to the last update for now, after Part 1 and Part 2 . This last part tie’s in with some items previously mentioned, like the bulkhead raisers and shock towers, as will soon become obvious. The standard Pulleys on the MTC1 are 20T for the centre, and 34T for axles, giving an internal ratio of 1.7. Now part of the issue with this, is that smaller axle pulleys have less belt wrap. This means the belts need to be run a bit tighter to avoid skipping, reducing efficiency, although this is more noticeable in stock classes than Mod, where belts are naturally run tighter. 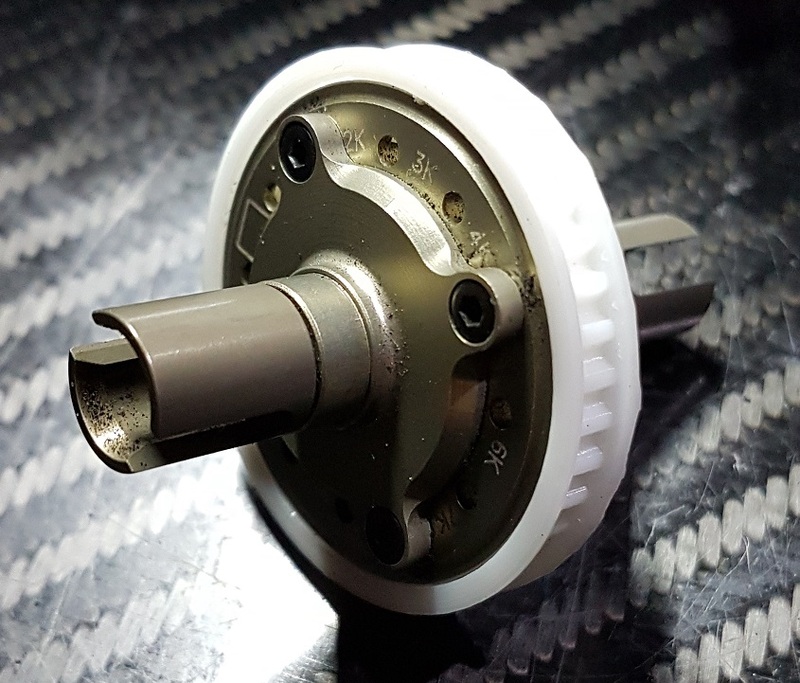 Sighting Yokomo as a recent example, they have recently gone back to larger pulleys from the 34T of the BD7’16-BD8 generation, back to the 40T pulleys with their BD8 SV and 2018 models, all with a notable upswing in results in the stock classes. So this got me thinking, and with the somewhat unique way that the pulleys mount to the diff and spool on the MTC1, figured I could give something a crack to try out bigger pulleys. Part of the incentive was to make use of my recently acquired Snapmaker 3D printer. So I sitting down with Solidworks, my calipers and a bit of internet research to get the teeth profile right (S3M pitch is what the majority of cars use), I set about drawing up some pulleys. I elected to go with 38T for the new pulleys, as I didn’t want to go to big (although obviously it’s still an option down the track), and having already made the shock towers and bulkhead raisers, didn’t want to have issues with interference. So 38 teeth it was, with the IR changing to 1.9. Quick diversion…. Increasing the teeth count also necessitates new belts, as there simply isn’t enough adjustment in the tensioners to make up the difference. With a bit of investigation, I realised that the new Destiny RX10-SR provided the answer. Bare with me here, as it took a little figuring out. As already mentioned, the MTC1 and BD8’17 have the same pulley sizes (20/34), but they also use the same drive belt lengths (507mm front, 180mm rear). Which means I could look for a cross reference using the BD8 as the basis. The RX10-SR has three drive train options, and two motor positions. One of the pulleys combo’s (20T/40T) matches that of the BD8’18, and with the motor backward, it also uses the same belts (516mm / 189mm). So the by extension, if I had used 40T pulleys for the MTC1, then it would also use the same belts, given that as shown above, the MTC1 is the same as a BD8 is this respect. Now back to the pulleys. For those questioning the suitability of 3D printed parts in general, I was pretty confident that they would at least be strong enough to survive a few runs as a proof of concept, and then order more durable parts from Shapeways. After all the Gizmo cars have made use of 3D printed diffs and spools for a few years already. Rev1 (below) was pretty much an exact copy of the standard parts, but with a bigger diameter to accommodate the extra teeth. The main addition is an extra flange to help contain the belt, as the bigger diameter means the teeth sit outside the metal flange used with the smaller pulleys. Now obviously, nothing flash, and the first prints were a little wobbly. One main issue was that the printer struggled to print the small flange holes properly, and with no fillets on the mounting parts, a couple of heads broke off. So the next revision corrected those errors, and the final pulley looks like this. It is a bit rough, thanks to the supports needed to actually produce the print, but fit’s well and screws bite the plastic nicely. Now, I had no idea at this stage at just how well the printed material would hold up, but with 30+ runs on them, they are still going strong with next to no wear. Biggest bug-bare is that the white colour shows up dirt far easier! On track performance is subtly different. The power band feels a little smoother (even when geared the same) with the car a little more adjustable on throttle. The belts don’t need to be run quite as tight, so can see this being a benefit in the lower powered stock classes. Certainly not a magic 0.5s/lap bullet, but I do like it so far. With how well the pulleys have lasted, I wanted to have a further play around. Whilst the standard Spool is a lovely machined piece, it is a bit on the portly side. From personal experience, going to a lighter front spool results in more steering. So, firing up Soldworks again, I set to work, and came up with the below. And weight wise, lost over 5g of rotating mass, or less than 50% of the original spool! Now this did take a few attempts to get right, with a bit of tuning of the internal dimensions for the outdrives. But, got to a more finished product, and despite the colour, looks good in the car. It is still a little rough around the edges, more due to the printing process than anything else, but eminently usable. I’ve only had the opportunity to run the car once with it so far, and that was the last run at the end of a long day of testing. Didn’t really end well, as only a few laps in had a bit of an ‘incident’ coming onto the back straight. Yes, thats the steel outdrive broken (along with a steering block), but the spool itself was undamaged. Puts the doubts about strength firmly to bed! Broken outdrive, but not the spool! So that basically covers all the recent stuff I’ve been working on to improve the MTC1. I’ve had a few people contact me asking for details on where to get the parts, and I am seriously considering having a couple of kits of parts made up as full kits. One would be a chassis/top-deck kit, and the other a ‘big-pulley’ kit, comprising of 1-piece spool, diff pulley, bulkhead raisers, belts and shock towers. If anyone is interested, shoot me an email via the contact page.